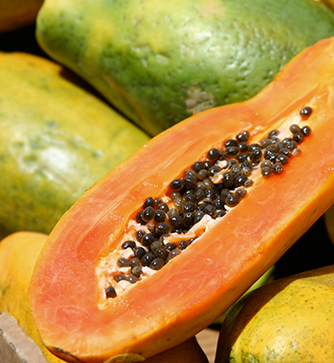 Red Papaya is ripe when skin is green/yellow. When ripe, cut fruit should have bright orange/red flesh. Both fruits are ripe when yield to gentle pressure. Yellow Papaw is ripe when the skin is yellow/orange. Ripe fruit when cut has bright yellow/orange flesh and black seeds. Both fruits are ripe when yield to gentle pressure.